February 24, 2014, 3:28 PM · Visitors to Universal Studios Florida already can get a first look at the London Embankment, the facade under construction in the park that hides The Wizarding World of Harry Potter - Diagon Alley. Universal's concept art for the embankment shows that there's quite a bit of space between those construction walls and the building facades themselves, space that ultimately will provide an urban park. In the park, you'll also find the Knight Bus, a triple-decker, purple AEC Regent III RT bus that carried Harry Potter to the Leaky Cauldron in Harry Potter and the Prisoner of Azkaban. The Knight Bus in front of Universal Studios Florida, before the Wizarding World of Harry Potter premiere in June 2010. Eventually, the Knight Bus is planned to provide some interactive animation elements for visitors (the talking shrunken head, perhaps? ), though I've not heard recently how close those elements are to being ready for the land's opening this summer. 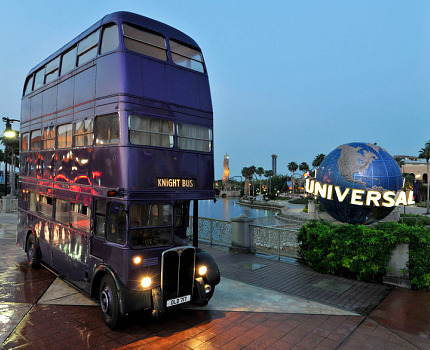 Nevertheless, the bus will provide an attractive photo op for Harry Potter fans visiting the new land. But let's look at the elements of the London Embankment facade itself. 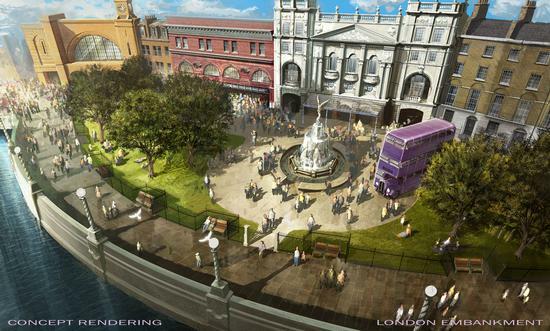 We've already written about King's Cross Station, located at the far left in the concept art. Let's continue down the embankment from there. The next element, to the right, is the Leicester Square tube station, which will provide the entry and exit for Diagon Alley. For those unfamiliar with London, the tube, or London Underground, is what Americans would call the subway system. (In the UK, a subway is a sidewalk that passes under a street.) Passing through the entryway of the station will bring you to a zigzag that will recreate the experience of the bricks opening to reveal the passage into Diagon Alley, as Harry experienced in Harry Potter and the Sorcerer's (Philosopher's) Stone. Behind the Leicester Square facade, and to the left as you enter Diagon Alley, you'll find The Leaky Cauldron restaurant, which will have a slim facade tucked between Leicester Square and King's Cross on the Embankment itself. 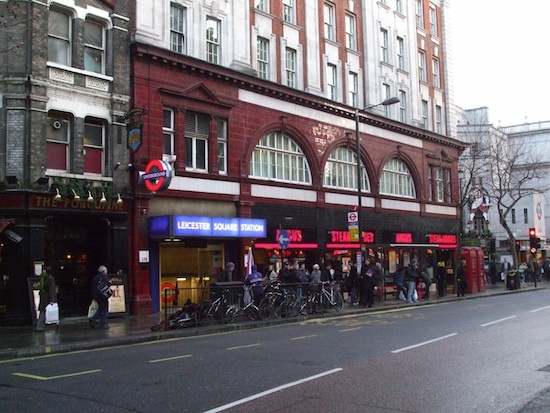 To the right of Leicester Square station stands Wyndham's Theatre, a London landmark that really does stand next to Leicester Square in real life. 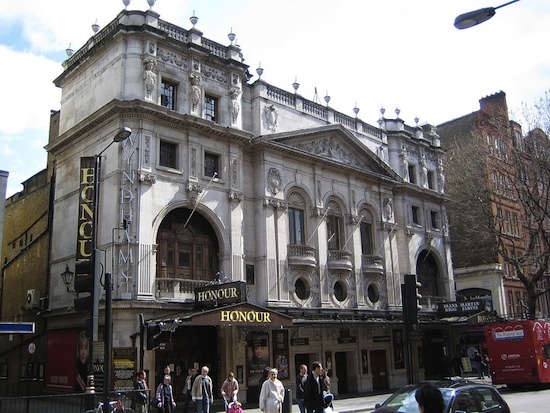 A West End stage theater opened by actor Charles Wyndham in 1899, Wyndham's Theatre over the years has offered performances by Tallulah Bankhead, Alec Guinness, Vanessa Redgrave, Jeremy Irons, and Maggie Smith (Harry Potter's own Minerva McGonagall). There's no theater here in Orlando, of course, Universal's Wyndham's Theatre facade stands in front of the Weasleys' Wizard Wheezes joke shop in Diagon Alley. 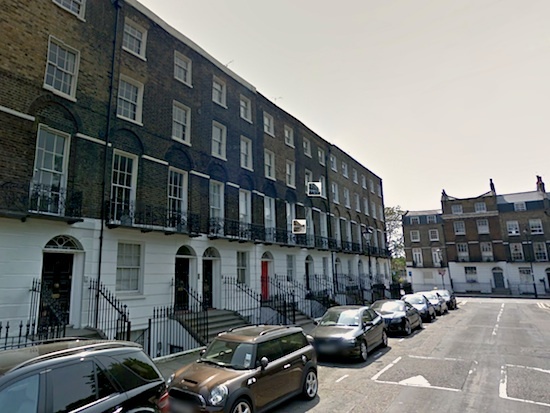 Continuing down the facade, we come to the final element in the London Embankment — the townhomes of Grimmauld Place, where the Order of the Phoenix met in Sirius Black's home at No. 12. Of course, No. 12 is hidden to Muggles, who've simply accepted the oddity of No. 13 standing next to No. 11 on the street. While Grimmauld Place is a fictional location, unlike the very real locations found elsewhere on the Embankment, the Grimmauld Place scenes in the Harry Potter movies were filmed at Claremont Square in London, which is actually located several miles from Wyndham's Theatre. Claremont Square, London. Photo via Google Maps. Universal and its partners have recreated these real-life landmarks in convincing detail, allowing Universal Studios Florida visitors to see London rising on the banks of the park's lagoon, while they await the opening of the newest Wizarding World of Harry Potter this summer. On the Road to Diagon Alley: How will Harry Potter and the Escape from Gringotts differ from Spider-Man and Transformers? February 24, 2014 at 4:05 PM · Robert -- Can you explain the "zigzag effect" of the bricks some more? I don't understand. How are they going to make it feel like you are going through a brick wall. I don't get the "zigzag" meaning. February 24, 2014 at 4:41 PM · The Knight Bus is not a working attraction? That's a missed opportunity. I would love a ride from the entrance to London with various stops along the way. That would be amazing. I believe the zigzag effect is, upon entering the station platform, you will see a impenetrable brick wall. It looks like you cannot pass through. The queue line then forces you to step to the side (left or right). Upon the diagonal, an entrance is revealed. I would think they can dress up the reveal in clever ways to make a more powerful presentation. February 24, 2014 at 4:44 PM · My impression has been that the Knight Bus wouldn't move, but ultimately would be a kind of walk-through attraction with interactive and/or animated elements. I've not heard much recently about the planned interactive elements in the land, so I'm not comfortable telling people that the Knight Bus will be anything other than a photo op when Diagon Alley opens. But I do know that more has been planned for the bus than sitting there as a prop. We'll see what we end up getting. February 24, 2014 at 6:32 PM · More than one person will end up in first aid trying to get through the brick wall. I thought that maybe an effect with mist and a projected image of a wall would have been the best choice. February 24, 2014 at 8:34 PM · As usual, Daniel is correct. A mist and projection is what I wanted too. That would be like going through a brick wall. Not sure why they did not do this because it would have been amazing.